Color is one of the basic elements of design, and many designers start off with just knowing that they want to make something purple. Or green. Or green and gold. Choosing your color scheme first is a perfectly natural pathway into designing. You might find that making your color decisions overlap your decisions about focal point or theme. Sometimes the focal point and color scheme develop together, one from another. Other times your theme will suggest or limit a color scheme. And still other times…you just simply want to make something purple. It’s all good. Usually I will choose the focal piece first and let the color scheme develop from that, but I’ve certainly also been known to do it the other way around. This piece is an example. 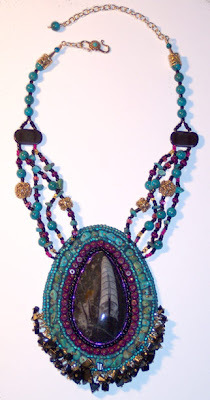 I was participating in a year-long project headed up by Dulcey Heller and Mary Elter, called Bead Art Exploration. One of our assignments was to pick a color scheme that we wouldn’t normally use. We all have our favorite colors and color schemes, but sometimes it’s nice to stretch a bit and see what else is possible. I have discovered that, using my focal piece to start, I will most naturally gravitate toward a monochromatic (tints, tones, shades, and pure color of a single hue) or analogous (several hues in close proximity on the color wheel) scheme if I make the choices intuitively. These are just combinations that I find naturally attractive. I will usually add a metallic color or a neutral (black, white, or grey) which best suits the warm or cool undertones of the main colors. But in the case of Nomadic Treasure, I chose to use a triadic scheme. Ouch! It didn’t feel natural at all, but I liked the results. Another method I have used to choose colors is to take my cue from a painting that I admire. Not surprisingly, the color scheme still most often ends up being monochromatic or analogous! I like to have a lot of textural interest in my work, but to avoid a cluttered look, and I’ve always felt that these two schemes allow me to achieve that. Still, it’s fun to play sometimes. In another attempt to stretch my safe and predictable color schemes, I read a book that I would highly recommend to everyone: Exploring Color, by Nita Leland. Although it was written for painters, Nita gives wonderfully clear explanations (with glorious full-color examples) of different color schemes and also of different ways of achieving contrast through color choices. She points out that the color wheel palette you use does not have to be based upon primary hues. The wheel could consist instead of tints, earthy shades, high intensities, muted tones, transparents, opaques, etc. Maybe this will seem obvious to you, but since I’m not primarily a painter, and was raised on the primary color wheel in school, this was very exciting stuff to me! Next Monday’s design element: Materials!